This was our last day in Russia as we crossed the border on the M3 / E101, bit sad as Russia has been fantastic and the people were brilliant. It was a long day today with many kms covered, not very comfortable on the 690 but we have a deadline to hit meeting up with the Irish tomorrow in L’viv. 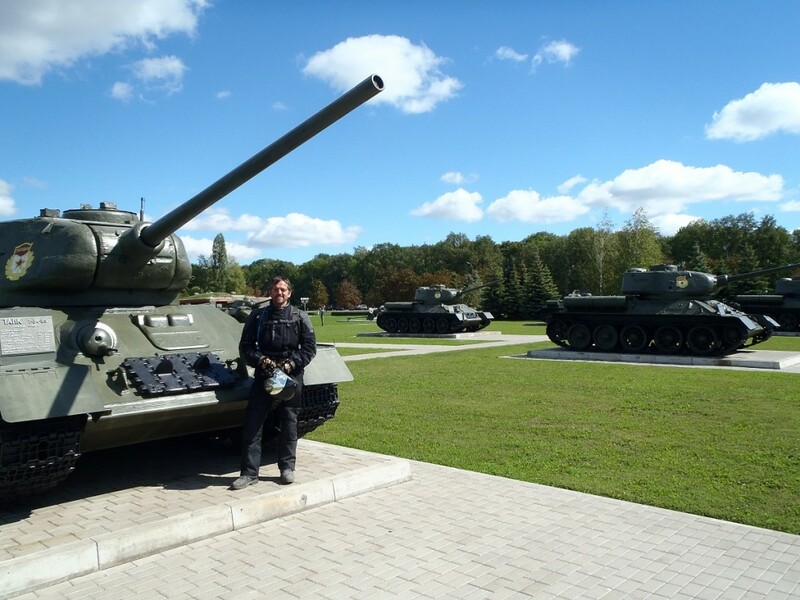 The weather was lovely and sunny as we started off to Kiev, all started well until the first petrol station we stopped in was being refurbished which shouldn’t have been a problem until the next 3 were also being refurbished or closedown. Eventually Kev ran out but as I have a safari tank holds 5 more ltrs we split that and thankfully the next petrol station although closed for lunch was open! After another hour of so we stopped for lunch in another roadside café and again had a good laugh with the girls while we were trying to decipher the menu. 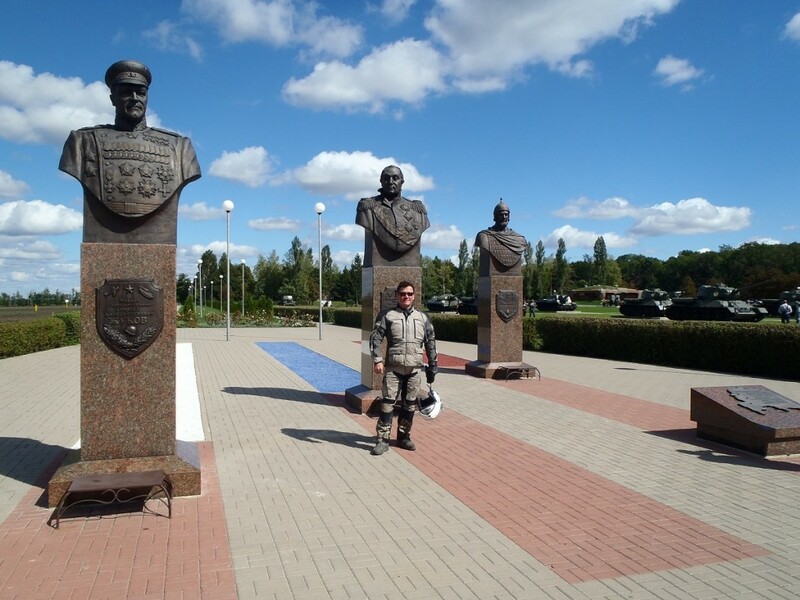 Then back on the road and nearing the Ukrainian boader we came across a war memorial, so stopped for some photo’s. 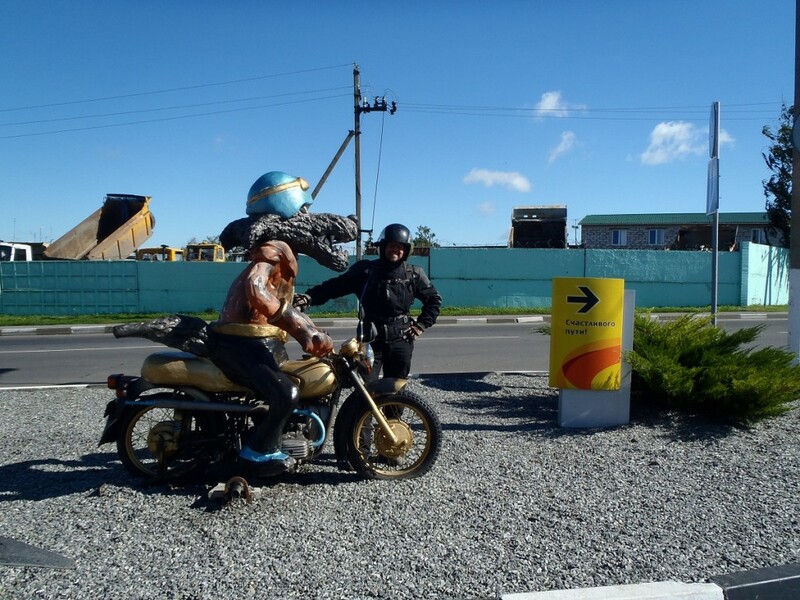 Got to the Russian border and we were the only ones there again so straight through without to much of a problem, the Ukraine border was a different kettle of fish with the first official asking for a present of $10 for coffee before he gave us the paper we needed. I stood there telling him why would I have $ when I’m english but he didn’t understand or didn’t want to understand, he even drew out 2 coffee cups = $10 (this man really wanted some money! 🙂 ). So after 10 minutes of explaining to him we didn’t have any $ I gave him a few rubles I had left in my pocket, no more than a couple of pounds worth. So it went on with the next 2 asking for money as well but we told them their colleagues cleaned us out and eventually we got through. This experience left us wondering what problems we’d have with the police if customs are so blatantly corrupt. Out of customs and a long ride to get to Kiev, time was ticking by, it started to get dark, and we were getting low on fuel and had no Ukrainian money. Just as we were entering Kiev we pulled over at a roadside motel / bar to ask if there was an ATM and fuel station nearby. Luckly the guy spoke good english and there was a supermarket which had an ATM and fuel pumps just across the road, he also had a couple of rooms free for the evening. Sorted bikes parked, money acquired, rooms rented, showered and down to the bar for some beers and food 🙂 .